Chicago resident and filmmaker Diana Quiñones Rivera, 39, did not hear from her family until eight days after the hurricane ravaged Puerto Rico. 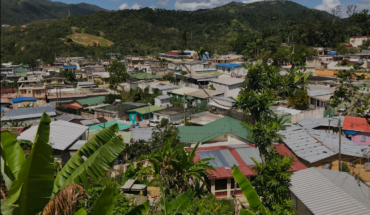 Her family lives in Utuado, a rural mountainous area that borders her hometown of Jayuya, which has become a symbol for the delayed recovery efforts throughout the island. Diana, along with thousands of others, joined Facebook groups and scanned pages for information about the situation in municipalities across Puerto Rico. She also downloaded Zello, an app that became popular among Puerto Ricans after the storm. Unfortunately, instead of reaching her family, she mostly encountered others like herself that had been unable to reach loved-ones back on the island. 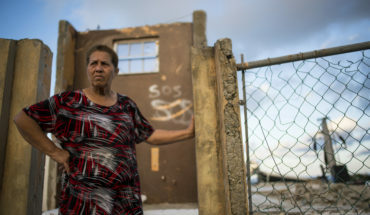 For many Puerto Ricans already living on the mainland, the days and weeks since Hurricane María devastated the island have been spent, among other things, booking flights and coordinating accommodations for family and friends —whether it was for a temporary stay or more permanent relocation. The first step, however, has often been simply getting in touch. Diana had last communicated with her brother via text message in the morning hours as the storm made landfall. Eight days later, she finally heard back from him. Her parents, both in their 60s, were fine, but they had yet to locate her sister. “My parents went to look for her, but they couldn’t find her,” she says. According to Diana, neighbors told her parents that their daughter was staying with her husband’s family, who lived in an area rendered inaccessible by a blocked road. Their home supposedly began to flood during the storm, forcing the family, including two children, one with severe autism, to flee up the mountain. In the meantime, Diana bought her mother a plane ticket to Chicago. She also sent supplies; such as batteries, candles, and a water filter, along with cash to her family. Yet Utuado, like many other towns in Puerto Rico, has been slow to receive aid due to collapsed bridges, blocked roads, and mudslides, according to reports. “I had already sent them supplies, but they hadn’t received anything yet,” says Diana. Two weeks after the hurricane, Diana came across a Washington Post article in which her mother appears in a photo waiting in line to buy ice. By then, Diana was closing in on her fundraising goal. She also had secured a place to stay in Chicago for her sister and her family. Her brother was weighing the option of a job offer in Florida, which has already received tens of thousands of Puerto Ricans according to officials. Though he has a job in Puerto Rico, he will most likely be relocating to the mainland with his family. Things have somewhat settled down for Diana. Her parents finally reached Diana’s sister almost three weeks after the storm. She and her family will most likely be traveling to Chicago later this month where friends of Diana will host them for the time being. Diana intends to help her sister find a job and enroll the children in school, as well as access the appropriate services for her sister’s autistic child. School districts around the country, particularly in Florida, are already preparing for an influx of students, with ESL classes and bilingual teachers being top priorities. Illinois is expected to be one of the top 10 destinations for new arrivals, according to a new report released by the Center for Puerto Rican Studies, with a median of roughly 2,600 people arriving this year alone and a three-year estimate of between 15,000 to 25,000. Local officials around the country aim to provide some basic services and support, though it remains to be seen what specific challenges lie ahead for Diana’s family and others coming over. Unfortunately, not all the news has been positive. The search for other relatives continues, which initially included two of Diana’s great uncles. Not long after reestablishing contact with Diana’s’ sister, however, the family learned that one of them had passed away in a hospital in Moca, a town on the northwestern coast, far from San Juan. Diana’s great uncle was hospitalized prior to the hurricane, having suffered a heart attack during hip surgery. While it’s not clear if Diana’s uncle would have survived if the storm had not hit, many patients remain in a vulnerable situation with hospitals running with limited resources and supplies. The official death count stands at 49, though some reports suggest that number could be closer to 450. Nevertheless, Diana is feeling more at ease than before. The initial uncertainty that rattled Puerto Ricans throughout the diaspora has become more of a day to day struggle. One priority is to stay closely in touch with family and friends on the island to see what they may need in the coming weeks and months. Many on the island are still without electricity, potable water, and other essential items. Most importantly, she hopes to visit and see loved ones in person. “Eventually, I just want to go to Puerto Rico and see my dad, other family, and friends,” she says. Diana also hopes to continue filming one of her current projects on the island, a feature-length documentary on traditional Puerto Rican bomba music and dance set against the backdrop of the economic crisis. With the hurricane, she anticipates each will take on an entirely new significance. 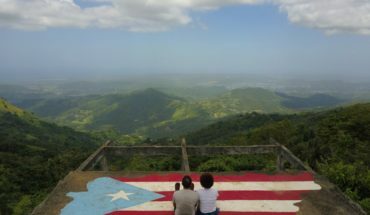 This story is part of Fi2W’s new series on migration from Puerto Rico in the wake of Hurricane Maria.